On September 28th, 2012 the Television Studies Commission of the International Federation of Television Archives, FIAT/IFTA, organised a one-day seminar at the British Film Institute in London. It was the second international television studies seminar organized by the TSC, after the first one took place in Paris at l’Institut National de l’ Audiovisuel in 2010. The seminar brought together television studies scholars and television archivists from around the world. In the year of the London Olympics, the morning session discussed the theme ‘Sport and the Olympics’. Dr. Eggo Müller from Utrecht University opened the event with a keynote speech on the Mediatization of Sport. He discussed sport in relation to a process of mediatization, zooming in on the diverse logics of sport and media and how the two intertwine. Arguing that sports and its mediatisation are in fact two sides of the some coin, Eggo Müller pointed out that the sports spectator’s has an intrinsic longing for mediatisation that is attained through processes of identification, representation and contemplation. 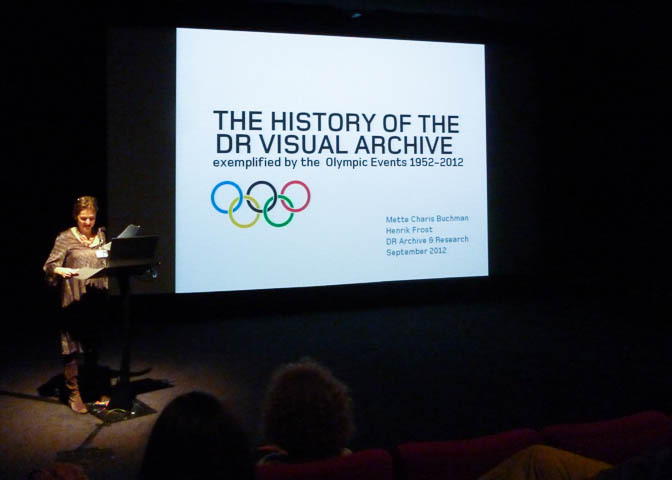 Mette Charis Buchman from Danmarks Radio Archives continued the series of talks on sport and television with a visual journey through Danish archival footage on the Olympics, accompanied by brief history of Danmarks Radio Archives. The afternoon sessions presented academic papers based on research done in several FIAT/IFTA member archives. In the panel Media and Politics, Ken Griffin from the University of Ulster drew upon research carried out at Ireland’s National Television and Radio Broadcaster RTÉ to discuss RTÉ ‘s early cross-border cooperation with the Northern Irish broadcaster UTV. Concepción Cascajosa from Carlos III University of Madrid illustrated footage from the Spanish broadcaster RTVE and discussed images of the masses as a representation of change in the aftermath of Franco’s death. Berber Hagedoorn from Utrecht University exemplified how Dutch broadcast archival footage is used in today’s multi platform television to visualize the history of World War II for young audiences in the Netherlands. The last panel of the day, British Perspectives, provided insights into different aspects of the history of British television. Elinor Groom from Nottingham University presented the findings of her research at the BFI Archives on the early history of ITV’s regional franchise Southern Television. Lisa Kerrigan from the British Film Institute (BFI) introduced lost footage of British television drama, which was recently rediscovered at the Library of Congress. Nathan Budzinski discussed the British television documentary tradition, zooming in specifically on the work of John Grierson. At the end of the day, Dana Mustata from the University of Groningen presented the open access journal VIEW. She spoke about the collaborative practices between academics and archivists on the journal and the ways in which the journal promotes innovative ways of writing television histories in a multi-media environment, allowing the integration of archival sources within academic articles. The seminar enabled a bridge of dialogue between television scholars and television archives and encouraged fruitful exchanges between them. Several members of the European Television History Network and EUscreen were present at the event. The seminar was organized under the umbrella of the FIAT/IFTA World Conference, which also hosted a joint EUscreen and Europeana panel. In the panel, Johan Oomen from the Netherlands Institute of Sound and Vision, David Smith from Europeana, Marco Rendina from Cinecittà Luce and Dana Mustata spoke about the accomplishments of EUscreen, offered a sneak preview into EUscreenXL and the future of online audiovisual archives and emphasized the value for television research of online audiovisual databases.